NASA is sending the Parker Solar Probe to the Sun; closer to the surface of our star than any other probe or spacecraft has ever ventured. The Parker Solar Probe will go within 4 million miles of the surface of the Sun, which even though it sounds like a huge distance isn’t all that much. The Solar Probe will face intense heat and radiation conditions as it makes its journey towards the Sun, and will provide humanity its first close-up views of the Sun, and any star ever for that matter. Simply head over to the Parker Solar Probe website, and fill out the basic details. You’ll get a confirmation email, confirm your entry by clicking the confirmation link in the email. 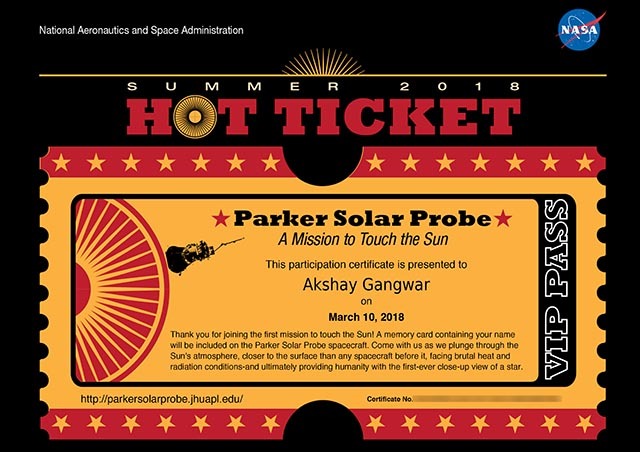 Once you do that, your name will be confirmed, and you will also receive a numbered certificate marking that you’ve submitted your name to be sent to the Sun aboard the Parker Solar Probe. Submitted names will be put on a memory card which will be put aboard the Parker Solar Probe. Currently, the probe has a 20-day launch window from July 31, 2018, to August 19, 2018. The probe is expected to perform its first Venus gravity-assisted flyby on September 28, 2018, and reach the first closest point of approach to the Sun on November 1, 2018. However, the closest the probe will reach the Sun will be in 2024, when it’ll be just 3.8 million miles away from the surface of the Sun. Just to put that in perspective, the Earth is 92 million miles away from the Sun, on average, and Mercury is 35.9 million miles.